Determination proved to be the greatest weapon for Toyota Quezon Avenue’s seasoned driver Allan Uy (Toyota Quezon Avenue) to weather big struggles on the track as the recently-crowned Toyota Vios Cup Season 3 Overall Champion. Uy was way off the list of top contenders for the coveted plum when his engine failed him, garnering no points during Race 5 and 6 of the disappointing Round 3 at the Clark International Speedway. Armed with a keen focus on details and strategy, and most of all, a big fighting heart, Uy staged a big comeback in the season finale also at the Clark International Speedway as he captured the crucial victory in Race 7 and finished seventh in Race 8 despite being ganged up by the top contenders. Earning a total of 48 points in the final leg, Uy finally saw the light of glory, ending the season with a total of 111 points to clinch the Super Sporting Class title and eventually claim the overall plum of this event, powered by Bridgestone, ROTA, Motul, Toyota Racing Development Denso, AVT, Brembo, OMP, and TuasonRacing.com. “It has been a rough but fruitful journey this season. Being part of the Vios Cup ever since it started two years ago has been a humbling experience. Going through tough struggles made me stronger and rewarded me with nothing but the best this year,” said Uy. Estefano Rivera (Toyota Alabang) emerged the overall first runner-up with 103 points while Basti Escalante of the Obengers saw his best season so far as he bagged the second runner-up title with 90 points. Dominic Ochoa (Toyota Quezon Avenue) wound up fourth overall with 83 points, and Daniel Miranda (Obengers) got fifth overall with 82 points. With regard to the Bridgestone Sporting Class, Steve Bicknell (Toyota San Fernando) won the crown with 112 points over Gerard Loy (Toyota Dagupan) with 108.5 points and Miko Maristela (Toyota Quezon Avenue) with 105 points. Sean Velasco (Toyota Cebu) gained 90 points as fourth placer while Sam YG got fifth place with 79 points. For the ROTA Promotional Class, Kiko Dysico (Toyota Cabanatuan) copped the title with 109 points over Marc Martinez (Marcars) with 98.5 points. Aira Medrano (Toyota Alabang) and Oliver Matias (Toyota San Fernando) both got 98 points but Medrano took advantage of having more podium finishes for the season making her earn the third spot while Matias holding the fourth place. Oscar Suarez (Toyota Cebu) landed fifth place with 80 points. Moreover, Jinno Rufino bagged the ROTA Celebrity Class crown over Fabio Ide and Jericho Rosales with 111 points. In addition, Vios Cup Season 3 also saw celebrity drivers Joyce Pring, Jasmine Curtis Smith, Derek Ramsay, and Arci Muñoz rise up to the challenge on the track. 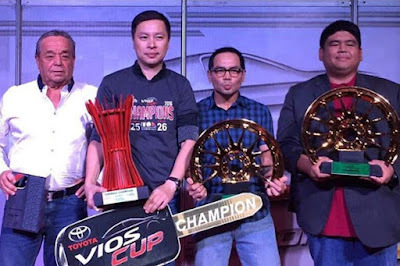 In fact, the influx of new drivers and the emergence of more champion-caliber young drivers resulted to an even more phenomenal Vios Cup Season 3 as the level of competition stepped up, which created tougher rivalries, more drama, and more thrilling plots that preserved the unpredictability of the series to the very last lap.